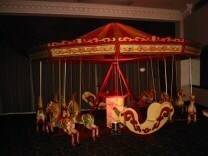 Irvin Amusements have Victorian swing boats available to hire. They are available either as a set of three (individual boats) of as a set of six (individual boats). The Carousel, also known as a merry-go-round is a traditional funfair ride that is great for children. Carousels usually feature wooden horses or other animals mounted on posts and it will give the affect of the animal galloping. 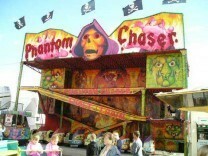 Fun Houses & Ghost Trains can commonly be found at most funfair and theme parks. They are perfect for everyone, providing timeless fun for every generation. Dodgems are a great ride for any funfair, event or party. 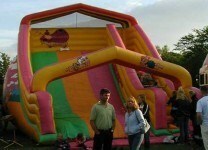 If you are looking for dodgem hire, then you have found the right place. Step Right up and prepare yourself for the thrill that has been exciting us for generations. Climb the Helter Skelter and find out what it’s like to slide down the spiralling slide. The helter skelter slide is often a fairground centrepiece and it will definitely provide you with great views once you reach the top. 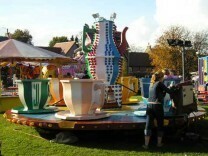 Traditional children’s rides from Irvin Amusements include the cup & saucer, also known as the teacups. Teacups rotate on a floor which then spins around a central point. 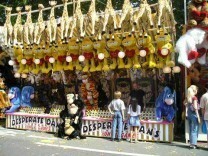 Irvin Amusements provide many different games stalls for funfairs, theme parks and parties. Our game stalls are very engaging and you will need strength and skill to master them. Trampolines are great entertainment for children and once they’ve experienced the trampoline they won’t want to stop. 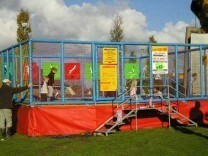 The Gogator is a must for any Fun Fair, Theme Park or Party. It Provides Timeless Fun for Everyone, from Young Children through to their Grand Parents.